Christopher Smith is an English director whose first feature, Creep (2004), was an attempt to emulate Gary Sherman’s Raw Meat (aka Deathline, 1973) and Douglas Cheek’s C.H.U.D. (1984); it had a woman trapped overnight in the London Underground, pursued by the mutant remnants of some medical experiments in a hidden lab, but it never quite found its footing and ended up wasting Franka Potente. I didn’t see his next movie, Severance (2006), but his third, Triangle (2009), had its moments with the story of a group of people who find themselves trapped on a ghostly ship, killed off one by one in what turns out to be a cyclically repeating nightmare. Unfortunately, the protagonist played by Melissa George was extremely irritating. But now, Smith has made a quantum leap in terms of both his storytelling and his work with actors. 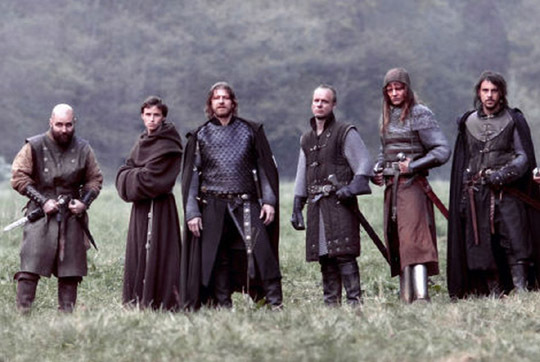 Black Death is a great looking medieval plague movie with a band of hardcase mercenaries sent off to find a village which has reputedly escaped the pestilence which has otherwise devastated the country; word is the inhabitants have made a pact with the devil. Osmund (Eddie Redmayne), a young novice monk, is drafted to lead them through the marshes to the village and along the way he witnesses a lot of unpleasant violence in a landscape populated by desperate, fearful peasants. When they reach the village, it turns out that it is indeed led by a woman who adheres to ancient pagan practices, but it turns out that nothing supernatural is going on – the village has been protected by its isolation – and the film becomes a gritty, intelligent clash between groups of “true believers” who are driven by their conflicting faiths to commit atrocities against each other. Although there are some inevitable anachronisms in the dialogue, Black Death is well designed and shot, with a strong cast who bring conviction to their roles, and a script and direction which don’t pull back from the appalling consequences of ideological conflict. 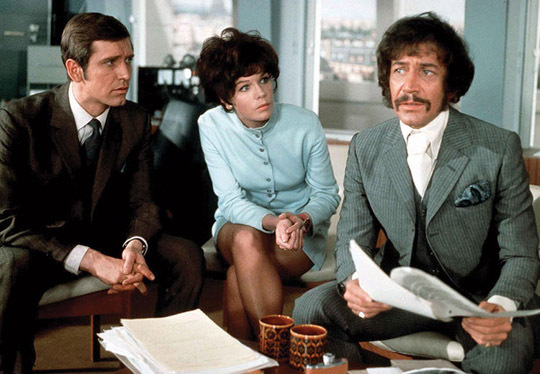 Department S (1969-70) was one of those numerous British post-Avengers series which never managed to recapture the flavour, or success, of the legendary show. Created by Monty Berman and Dennis Spooner, who between them were involved in pretty much every crime and adventure show of the period, it consistently fails to achieve its aims. Each episode begins with an intriguing, “impossible” event which is investigated by three operatives from an Interpol office based in Paris: American Stewart Sullivan (Joel Fabiani), supposedly the man of action; computer expert Annabelle Hurst (Rosemary Nicols); and pulp thriller writer Jason King (Peter Wyngarde, who went on to star in his own spin-off series in 1971-72). Although these three supposedly combine to form the perfect mystery solving team, they usually fumble incompetently through a lot of coincidences until the solution (almost invariably mundane) is sprung on the audience without much warning. I’m not sure why I’m still making my way through Network’s 8-disk complete edition, other than a stubborn determination to see the whole thing through, but I watch a couple of episodes every week or two. Seven episodes of The Avengers (and two of The New Avengers [1976-77]) were directed by James Hill, whose short feature Lunch Hour (1962) is one of the latest releases from the BFI’s Flipside series. It’s a rather didactic period piece rooted in what now seems an oddly quaint early-’60s world; the script by John Mortimer (famous as author of Rumpole of the Bailey) follows a middle-aged married businessman (Robert Stephens, from Peter Newbrook’s The Asphyx  and Billy Wilder’s The Private Life of Sherlock Holmes  among others) as he falls for and tries to start an affair with a young art school grad (Shirley Anne Field, who the next year would co-star in Joseph Losey’s great sci-fi/horror The Damned) who has just started with the company. He’s shy and nervous, she’s more confident and quite open to the attraction they share, but every attempt to get a bit of privacy is interrupted. Out of frustration, the man finally rents a room at a small private hotel for a one-hour lunchtime rendezvous. When they get to the room, the landlady says things which confuse the young woman and it turns out that the man has told a big, elaborate lie to get them the room, about them being married but having to live apart with him down in London and her up in Scarborough, and that she has come down for the day to have a serious talk with him, leaving their two kids with an aunt in Hampstead. The woman begins to take on the role he has assigned to her, and the fantasy gets out of hand as they go through a speeded up marriage and arrive at a point where she wants to divorce him. The romance is over without ever having been consummated and the woman has achieved a kind of independence which was still being strived for by women in the early ’60s. Although nicely shot in black-and-white by Wolfgang Suchitzky, the film feels stilted, with the kind of blatant thematic foregrounding you’d expect from a student film. Hill, however, wasn’t a student when he made it, but an award-winning director of creative industrial films. The BFI disk includes three of his shorts made for British Petroleum (best known now for last year’s Gulf disaster). Skyhook (1958) is an ode to oil exploration and development with a crew using a helicopter to fly a drilling rig into an inaccessible part of New Guinea; today, the bulldozing of virgin forest and construction of the drilling rig evoke feelings far different from the glowing admiration the film expects. The other two shorts get away from traditional industrial techniques and use charming comic dramas to generate an indirect fuzzy glow about BP. 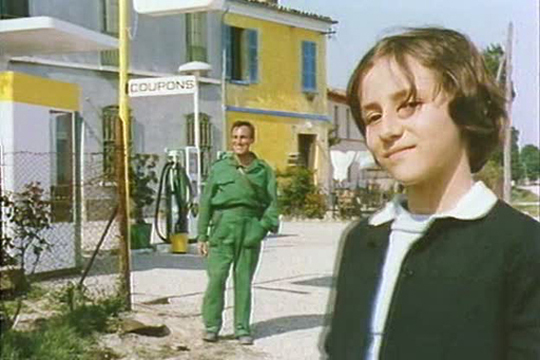 Giuseppina (1959) was made as the company was entering the market in Italy and presents a day in the life of the young daughter of a gas station owner in the picturesque countryside. She wants to go visit the fair in town, but her father is too busy to take her; so she observes all the small interactions with the customers who pass by, a collection of national stereotypes which make the gas station seem like a fun and entertaining place. Strangely, this film won an Oscar for best documentary short in 1961, even though there isn’t a speck of documentary in it. The third short, The Home-Made Car (1963), is a dialogue-less story about a young man who hand-builds an old car while trying to attract the attention of his next door neighbour, who’s going out with a smarmy guy in a flashy sportscar. 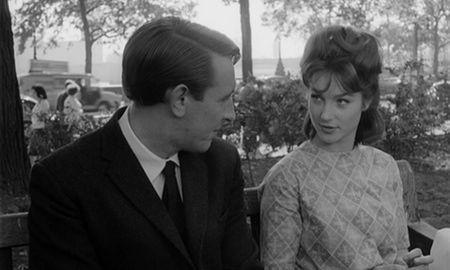 The other Flipside disk is Michael Sarne’s Joanna (1968), a very ’60s feature about a vacuous, narcissitic middle-class girl (Genevieve Waite) who moves from the country to go to art school and experiences Swinging London. She’s sexually uninhibited, picks up tips from her friend Beryl (Glenna Forster-Jones) on how to steal from stores and get free meals, and eventually becomes involved with Beryl’s brother Gordon (Calvin Lockhart). Vibrantly shot by the great Walter Lassally, who came up through the Free Cinema movement and the British New Wave, the film is by turns engaging and irritating, Sarne’s non-linear style, which mixes events with subjective impressions and dream/fantasy sequences, struggling against a fairly conventional narrative which eventually becomes interesting in its depiction of the interracial relationship between Joanna and Gordon. The characters, and the film itself, make no big deal about this, but towards the end, when Gordon gets in trouble with some gangsters who are leaning on his nightclub for protection money and he ends up on the run from the police, social forces call attention to the purely external difficulties faced by the couple. By the time Gordon is sent to prison and Joanna heads home pregnant with his child, she has apparently matured and found something worthwhile to live for. Looking back on the film now, it seems most notable for an early idiosyncratic performance by Donald Sutherland as a wealthy aristocrat whose attitude towards life most deeply affects Joanna; dying of leukemia, Lord Peter Sanderson is determined to live in the present moment and give pleasure to others. Sutherland stands out partly because his character possesses some genuine charm, but also because of a bizarrely stilted accent which makes him come across as the kind of upper class twit Monty Python used to mock mercilessly. Former pop singer and actor Sarne, of course, went on to direct the notorious adaptation of Gore Vidal’s Myra Breckinridge (1970), a campy cult favourite. And finally, there’s the documentary Henri-Georges Clouzot’s Inferno (2009), a kind of French Hearts of Darkness about the failed project of the great director (The Wages of Fear , Les Diaboliques ) to create what he saw as a new kind of film, one which would be able to recreate complex psychological states through expressive images and sounds. The narrative of Inferno itself was a fairly simple, small-scale story of a marriage collapsing under the weight of the husband’s delusions about his wife’s unfaithfulness, but Clouzot was more concerned with exploring new stylistic territory, a desire facilitated by an unlimited supply of American money. With no one overseeing the work and pushing him towards completion, he foundered catastrophically, alienating cast and crew, and finally having a heart attack which brought the project to a premature end. Forty years later French film authority Serge Bromberg (collector, and founder of Lobster Films, one of the premier restorers of silent movies) heard about the project from Clouzot’s widow and tracked down a stash of 185 reels of exposed film (sadly without any of the audio); he and co-director Ruxandra Medrea gathered together surviving members of the crew for interviews and pieced together the remnants of the unfinished film and the story of its unmaking. The imagery is often startling, both the extended tests of various in-camera effects techniques to evoke deranged mental states, and the more naturalistic narrative scenes shot on location by a lake beneath a towering railway bridge (the impressive Garabit Viaduct built by Gustav Eiffel). The film starred a young, sensuous Romy Schneider as the wife and brooding Serge Reggiani as her older husband, and even without sound, their scenes evoke an emotional intensity which makes you want to see the finished film. While that isn’t possible, you can still get some idea of the story by watching Claude Chabrol’s film of the script, L’Enfer (1994) starring Emmanuelle Beart and Francois Cluzet. Stripped of Clouzot’s visual experimentation, the story fits perfectly with Chabrol’s interest in middle class pathology and murder, but his plain, straightforward approach doesn’t have any of the impact suggested by the fragments left by Clouzot. Bromberg and Medrea have done a superb job of interweaving the story within the film with the story of the making, Clouzot’s obsessive descent into a kind of madness reflecting the spiralling descent of his character. 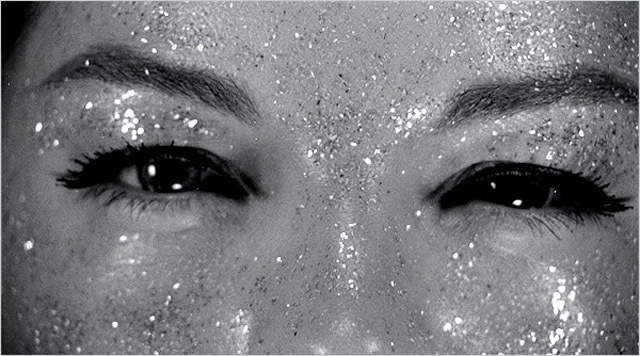 After his heart attack, Clouzot made only one more feature, La Prisonniere (1968), in which he apparently finally got to use those visual techniques he had developed for Inferno, but the film was released without much notice. This entry was posted in Review and tagged BFI, British Film, British Television, Christopher Smith, Donald Sutherland, DVD, French Film, Henri-Georges Clouzot, Home Video, James Hill, Michael Sarne, Review. Bookmark the permalink.